Are Our Kids Safe Online? In this day and age, most children use tablets and devices for a myriad of reasons. Many use them as a learning aid at a very early age; watching YouTube to learn to draw animals and food items, or playing parent-approved games to help learn their alphabet, colors, and shapes. But, these devices also allow access to games, social media, tv shows and movies that we may not be completely aware of, unless heavily monitored. As they get older, our kids are tempted to turn to social media and their online “friends” to discuss what’s on their mind and get answers to their questions on some pretty important issues. 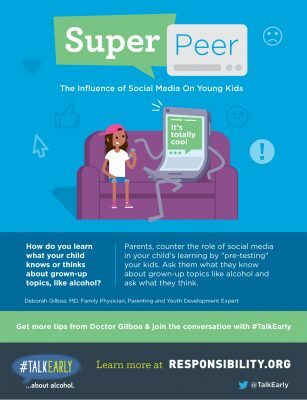 At our Talk Early Summit last Fall, we heard from a few parenting experts on our responsibilities as parents, but I vividly recall social media channels being referred to as “Super Peers” for kids by Dr. Vincent. Think about that for a minute. Not only are our children influenced by those physically around them – family members, friends at school, families in our neighborhoods – but they are influenced daily by who they see and converse with behind that screen, whether that is through social media sites or what they are reading and seeing on that screen. Sometimes even more so than who is physically surrounding them. I couldn’t agree more. Be an active part of what your children do online, whether it’s watching those tutorial videos with them, playing the games, or scrolling through their Instagram accounts regularly. Ask them questions, listen to them, and be open with them. According to a 2015 study conducted by Common Sense Media, tweens, defined as kids ages 8-12, spend 6 hours/day consuming media. It is common for tweens and young kids to “multi-task”- or play on a device while also sitting in front of the TV. What is your advice for parents with younger kids, even those with kids as young as 6-10, who have children using tablets, cell phones, or laptops while watching TV? How do parents best monitor what their kids are doing and their social media habits? There are three ways to manage these behaviors, and all depend on making boundaries clear to your tween. The first is to know what devices your child has and to have limits on how and when a child may use them. The second is to spend screen time with kids, modeling how you’d like them to use screens and engaging with what they are doing on those screens. The last and most important is to communicate with kids about the purpose of screens in their lives and the ways they use them towards those purposes. Our tweens will soon be teens and then adults; these thoughtful discussions will do more to inform their futures than any rule could. Kids are getting cell phones at younger ages these days, research indicates 60% of 10-year-olds have cell phones. How do parents first establish good rules and expectations with kids this age having access to cell phones? What should we parents consider about our own behaviors as we are setting the tone and expectation in our house? Think about the where, when and what of cell phones. If you feel your tween needs a phone, what about a “dumb” phone that doesn’t have internet access? If you feel that internet access is truly necessary, then set up clear boundaries for where and when phones can and can’t be used. Make sure those phones are charging from an hour before bedtime, in a parent’s bedroom. Keep a few spaces sacred, like the dinner table and bed. Don’t use a cell phone in a way that you don’t want your child to use a cell phone when they are an adult. And monitor content, even though it’s hard! Research from Common Sense Media indicates a gender divide in how boys vs. girls consume digital content. Their report indicates boys are bigger consumers of video games while girls are more prone to spend time on Instagram. How do parents positively influence their habits and perceptions from being on these channels or games, especially if young tweens are on these channels and playing online games? No matter your child’s gender, there are great and awful things about the apps and games your kids use. The only way to know is to explore those on your own, on trusted sites like Common Sense and with your child! Ask your child for a tutorial of each game or app they use, and benefit from your child’s expertise about what is good and what is questionable. Engage your tween (even your young tween) in conversation about what the challenges are and how your family can overcome those challenges. And don’t be afraid to say “no” to an app or game. Even if everyone else is allowed. Disclosure: I have been compensated for this post in partnership with the #TalkEarly program as a blogging ambassador. As usual, all thoughts and opinions are mine.